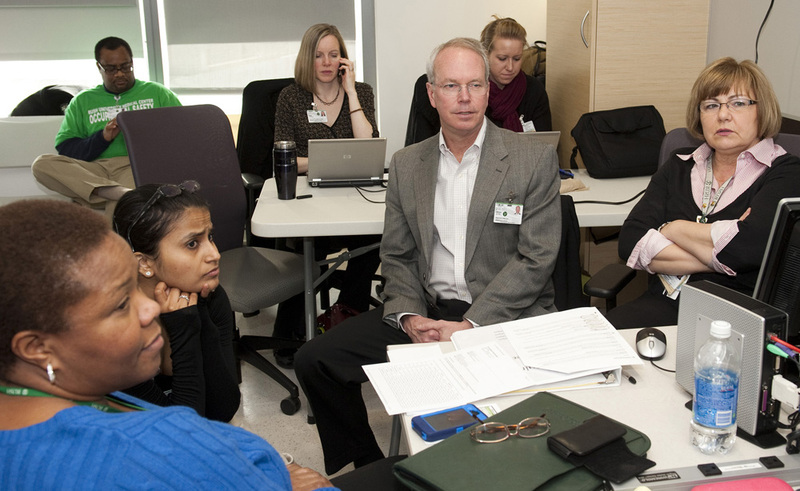 Anne Burgeson (back row, center), in the command center for the move into Rush's new hospital. Busy, exhilarating, funny, innovative and LOUD. Those are just a few words to describe the Hospital Incident Command Center at Rush on Sunday, Jan. 8, during our move of about 180 patients to the Tower, the newest hospital building on our campus. Packed with people, chairs, temporary tables, telephones and computers, the hospital incident command center was the base of operations to manage the move. In what will be a patient labor/delivery room on the eighth floor of the Tower, leaders representing departments from throughout Rush gathered from 5 a.m. until 7 p.m. to handle questions, problem-solve together and oversee all aspects of the move. This was also the place to receive all calls from employees throughout Rush who needed any assistance related to the move. From simple things like determining how to quickly fix a loose ceiling tile, to more complex issues such as determining why an alarm was activated on a piece of equipment, the group worked together in a truly collaborative way, to make quick, effective, well-informed decisions. What was most important appeared up on one wall of the command center. A large screen showed real-time video of the caregivers as they patiently, skillfully and carefully moved Rush patients in wheelchairs or gurneys. Teams moved acute care patients and then critical care patients throughout the day. And each time a patient was moved, members of the command center team watched, cheered and, in general, were in awe of the teams of transporters, nurses, physicians and other caregivers who made this tremendous task look easy. Anne Burgeson is internal communications director at Rush University Medical Center. This entry was posted in New Hospital Building, Rush Transformation and tagged new hospital, newrushhospital. Bookmark the permalink.